Lizard Kisses' dreamy new EP is the perfect interlude for spring. The first time Diana and I were introduced to duo Lizard Kisses was in 2011 on Unholy Rhythms' and Cactus-Mouth's curated compilation Tears on my Pillow. The two-part digital record had artists covering old time love songs such as "Moon River", "Love Hurts, and "Tip Toe Through the Tulips." Lizard Kisses covered the melancholy "Please Stay", which was originally performed by The Drifters. Although many of the artists on the compilation were deviating from their typical sound, Lizard Kisses, also known as Cory Siegler and Marc Merza, were naturals at creating an updated version of the heartbreaking sixties melody. This influence carried over and comes out in full force on their upcoming EP, Loving Creatures. But a little history about the pair: Cory and Marc met in 2010 and spent the summer recording music together in Vermont. Since then, they've released a small handful of albums and singles that grow stronger with every new recording. Loving Creatures, which will be physically released by WeePOP Records, was recorded during Hurricane Sandy and is being made available to the world just as the first inklings of spring appear. "The Storm" opens Loving Creatures and its a perfect introduction to the dreamy vintage world Cory and Marc create in this particular grouping of songs. "The Storm" shows Lizard Kisses' own take on the classic sixties drum intro while Siegler wistfully sings "I think I would die if you weren't around." "Blue You", a twinkling piece about love lost, makes me wish I was being twirled around during the slow song at a sock hop. The track "Stones" closes off the album, with shimmering guitars that showcase Siegler's stunning vocals. The short album can be yours by paying what you want on bandcamp, but it's worth the small fee for the physical product. The CD, which is a small 3" disc, comes in a hand sewn and screen printed sleeve with small book of illustrations, created by Edie Fake, one of their favorite artists. 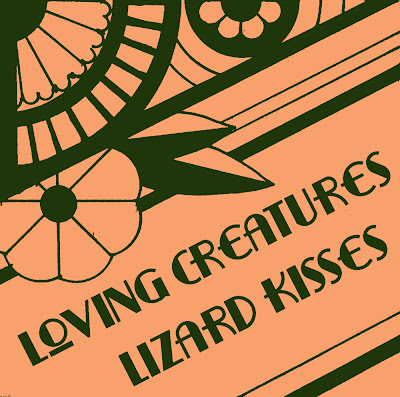 Between their music and their dedication to creating something unique and personal for their fans, we're not sure what we love more about Lizard Kisses. You can listen to Loving Creatures and buy the CD here.